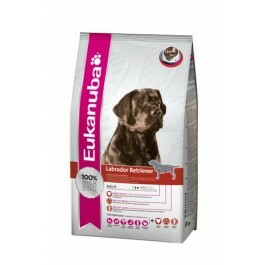 Eukanuba's Best Adult Dry Dog Food for Labrador Retrievers, also ideal for Curly Coated and Chesapeake Bay Retrievers, is formulated with L-Carnitine and natural Taurine, important nutrients to keep your dog's heart healthy - and tailored levels of L-Carnitine will help him naturally burn fat. This Breed Nutrition diet has added Glucosamine and Chondroitin Sulphate, which help support healthy joints. It also has clinically proven antioxidants that help build strong natural defences and Omega-6 and 3 fatty acids that contribute to a healthy skin and radiant coat. This canine food also promotes digestive health and optimizes nutrient absorption, thanks to prebiotics and clinically proven beet pulp. Plus, while the animal-based proteins help maintain strong and lean muscles, calcium helps support strong bones. Eukanuba Breed Nutrition formulas are developed with veterinarians and recommended by top breeders, made with high quality premium ingredients, to give your dog 100% complete and balanced nutrition. Every Eukanuba Adult Dry Dog Food diet has 3D DentaDefense technology, which cleans with every bite, reducing tartar build up by up to 80%* and also helps your dog maintain strong teeth. Breed Specific: To meet the needs of special breeds. 1 Mighty -Helps naturally burn fat while preserving lean muscle, with L-carnitine. 2 Agility - Formulated to help support healthy joints with added Glucosamine and Chondroitin Sulphate. 3 Heart - Formulated to support a healthy heart with L-carnitine and natural taurine. 4 Dental - Clinically proven to reduce tartar build-up in 28 days. Reduces plaque and maintains strong teeth. 5 Shine - Promotes healthy skin and radiant coat with clinically proven optimal ratio of omega 6 and 3 fatty acids. 6 Defend - Helps support a Labrador's strong natural defences with clinically proven antioxidant. Labrador Retrievers are an extremely popular choice of dog; they are both gentle and affectionate. If they do not exercise regularly they can gain weight easily and excess weight can put stress on their joints meaning they can benefit from extra nutritional care. Also suitable for Curly coated and Chesapeake Bay Retrievers, who share the same nutritional needs. Feeding your dog: When feeding for the first time, gradually introduce Eukanuba into your dog's diet over a period of 4 days. We recommend feeding your dog twice a day. Divide the daily amount shown in the chart by the number of meals. Your dog may eat more or less depending on age, temperament and activity level. Always have plenty of fresh water available for your dogs to drink.